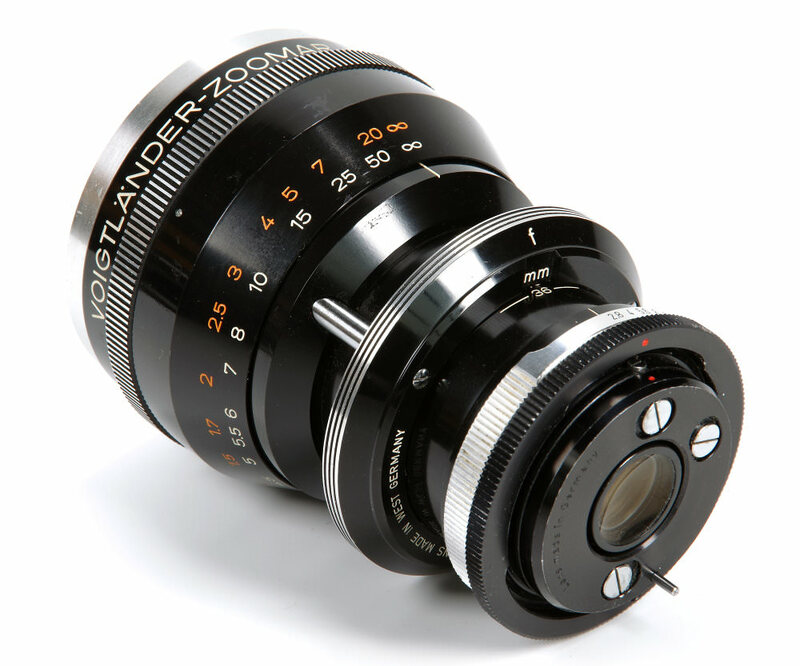 Zoom lenses have long been used in cinematography, but in 1959 Dr Frank G Back of Zoomar Corporation of New York saw his Zoomar lens design released in suitable mounts for SLR cameras. The new lens was a revelation – continuously variable focal lengths, all in one simple action, and a constant f/2.8 aperture, something previously beyond the available technology. Manufactured by Voigtlander in West Germany and initially intended for use on the clunky but superbly made Voigtlander Bessamatic SLR, the Zoomar was revolutionary as well as expensive. Here in 2018, almost 60 years later, we put the Zoomar onto the Canon EOS 5DS R full frame 50MP DSLR. Let's see whether that original zoom design is still up to the mark and usable, or whether it is relegated to being just a collector's item. We forget plastics and have a solid mass of metal and glass that weighs in at a not unmanageable 810g. Oddly in a way, this is not overly heavy as modern lenses have tended to become heavier and bulkier in many cases. But this construction is traditional and very sturdy, not least with its three solid metal rods that hold the zooming mechanism rock solid. But first our tour of the lens. 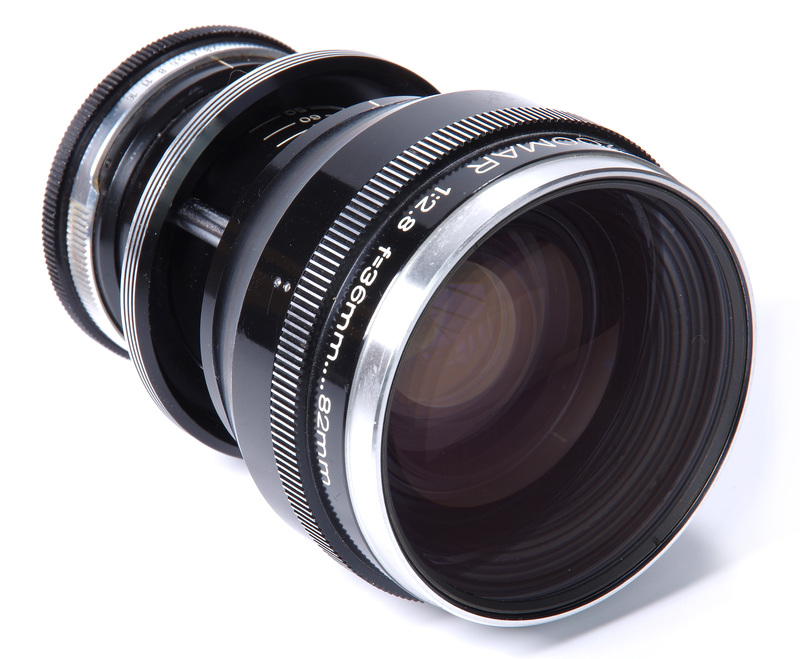 The huge front element has a standard 95mm filter thread and also a metal rim that would hold the Voigtlander Clamping Ring. 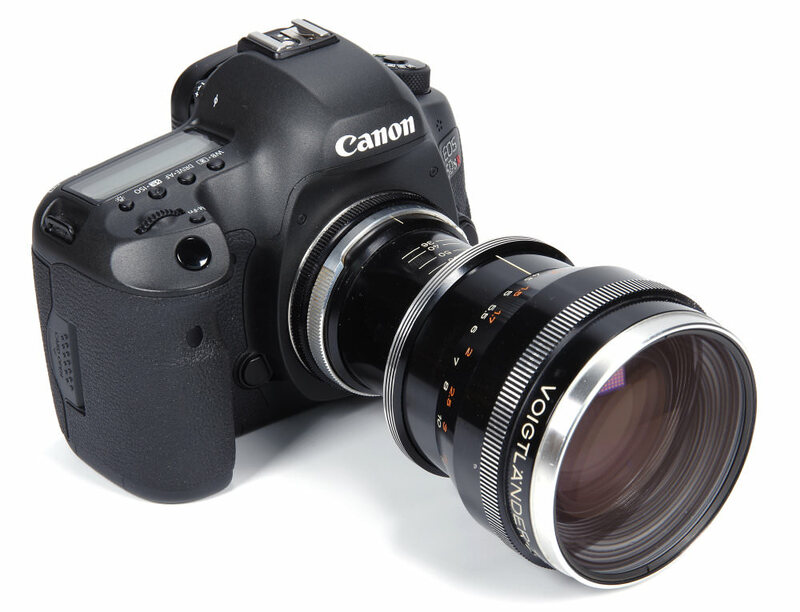 This ring would enable the use of the special close up lenses, filters and the enormous rubber lens hood. None of these accessories came with the lens, nor did the disc type calculator for Depth of Field that the instruction books tell us was supplied with every lens. The whole front section is for focusing via a smooth helical thread and is clearly marked in feet and metres. One of the limitations of vintage lenses is revealed here, because focusing is only down to 1.3m, or slightly under 4.5 feet. This is possibly tolerable for an 82mm lens, but not really anywhere near close enough for 36mm. Hence the original supply of the now missing close up lenses. The zoom ring is literally a ring, supported by the aforementioned three metal rods. The focal lengths are clearly marked on the lens barrel. The action is still firm and smooth in this sample of the lens, despite its age. The Zoomar is also definitely a parfocal zoom, meaning that when zoomed the lens retains its point of focus. It also retains it very well. This means that focusing can be done at 82mm for greatest accuracy and then the lens zoomed back to the required setting. This doesn't work with most modern zooms as they are usually varifocal, needing refocusing after zooming, but of course, with AF this matters less. There is no such luxury with the Zoomar, with its dim viewfinder view and tricky manual focus. There is one more accessory of note that was also not available for this review and that is the Tripod Adapter. This is simply a small bracket that attaches to the tripod and brings the centre of gravity more into line with the very front heavy lens. It is more of a matter of balance as the DSLR mount is more than capable of supporting the weight of far heavier lenses than this. The instruction manual states that this is to prevent the tripod tipping over, a reminder that tripods of the era could be quite insubstantial compared to good modern ones. The optical construction is 14 elements in 5 groups. Three of these groups are fixed and two move. It is possible that some of the more specialist glasses used may be mildly radioactive, in common with some other high-quality lenses of the era. Finally, the mount. A variety of mounts became available, but here we have the Zeiss Ikon Icarex 35S mount. Interestingly, this is a breech mount not dissimilar to Canon's original mount. The essence of the breech mount is that the lens is simply inserted and a collar rotated to lock it into position. There is no rotation of lens against mount and therefore no wear. It is an excellent but expensive to manufacture method of designing a mount. 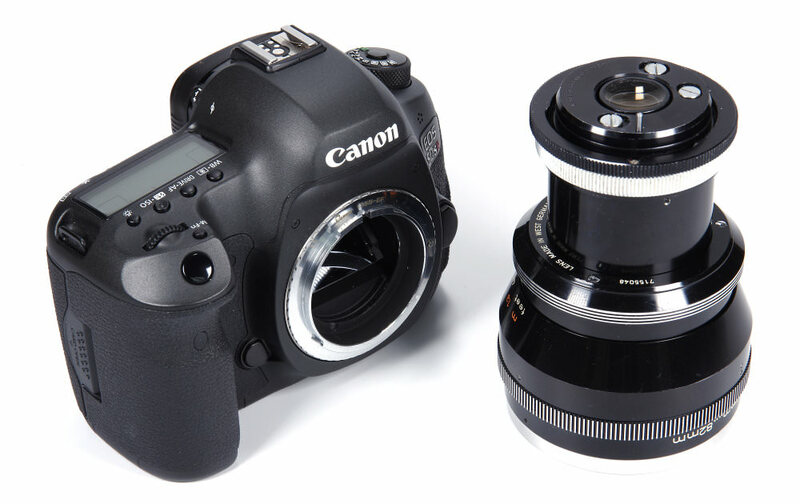 To fit the Icarex fit camera to a Canon body a simple adapter can be sourced via eBay or Amazon, costing just under £30. So far so good, but what about the handling? Very clunky is the short answer. The lens is obviously manual focus only, but incredibly difficult to focus as well with modern DSLR screens. The LiveView option is better, but the exact point of focus difficult to judge and needing very careful adjustment. The diaphragm is stop down only with this mount and adapter, so the image darkens as it is stopped down. The Canon metering system works using Manual but not very accurately, so a separate meter may be needed. If using Live View, at least on the Canon EOS 5DS R it proved possible to roughly gauge the exposure using the brightness of the screen as a guide. A bit of guesswork and some bracketing makes this a quicker process than it would otherwise be.